Notes: The Prince of Wales Pier was designed by the distinguished civil engineer Sir John Coode, KCMG, President of the Institution of Civil Engineers in 1890-92 and completed after his death in March 1892 to designs by Coode, Son and Matthews. It was built by the Dover Harbour Board to give shelter to the east side of the harbour. The works marking the beginning of the Harbour Board's new east pier were given a royal inauguration on 20 July 1893, HRH the Prince of Wales (later King Edward VII) laying the first stone of the intended pier in high wind and driving rain. At the start of the ceremony, two large sealed bottles containing some newspapers and various coins of the realm were placed in the foundations of the approach road. That done, an ornate silver trowel was handed to the Prince who solemnly adjusted the foundation bed, after which the stone itself, consisting of Cornish granite, was placed on top. Two or three taps with an ivory mallet and the stone was declared well and truly laid. The east pier now became known as the Prince of Wales Pier. The pier was 2,910ft in length with the landward curved entrance section constructed of stone with granite coping and cast iron railings. There were cast iron pedestrian and vehicle gates at the north end of the pier and a small kiosk for collecting tolls. The middle section was constructed on a framework of cast iron trestles on screw piles with lattice girders, similar to many other Victorian seaside piers of the time. 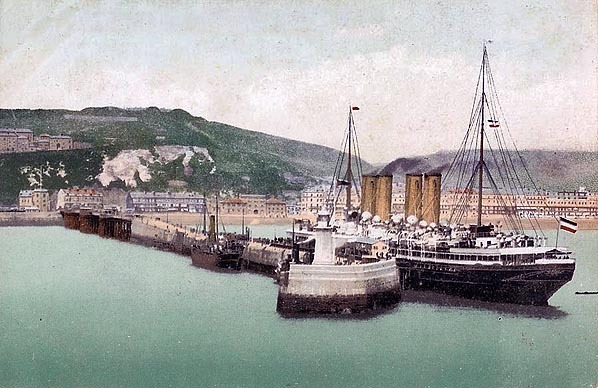 In fact the Prince of Wales was the second lattice pier to be built in Dover. 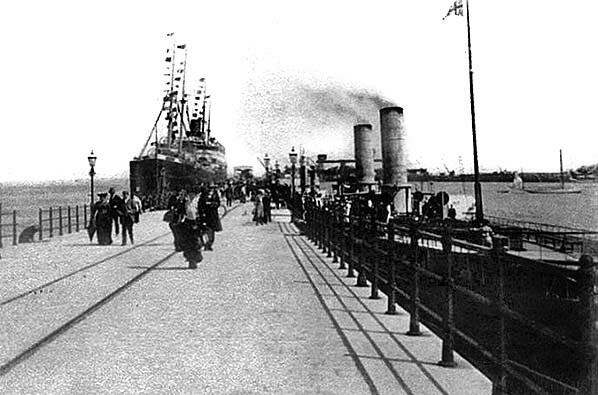 The first was the 900ft Promenade Pier which opened in May 1893. The Promenade was a typical seaside pier with a wide promenade and summer concerts in the pavilion until it was purchased by the Admiralty in 1913 for use as a naval landing stage. It was never used by the public again and was demolished in 1927. The seaward half of the Prince of Wales pier was constructed of stone with granite copings, with three landing stages on either side for the use of both cross-Channel steamers (on the west side) and for transatlantic liners, for which a berth was built on the east side in 1904. The seaward end terminated in a circular pier head with a flight of granite steps. At the end of the pier there was a painted tapered granite lighthouse with a cylindrical lantern room and external gallery surmounted by a metal weather vane. There were public walkways 6ft wide either side of the 18ft-wide central roadway, and cast iron lamp standards lined each side bearing the shield of Dover Harbour Board. 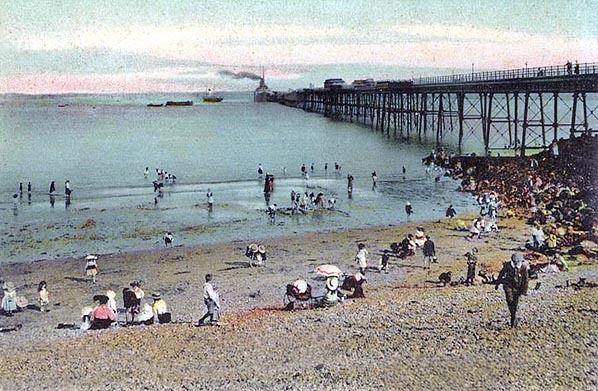 The pier opened on 1 January 1902 at a time when turbine steamers were beginning to replace paddle steamers. 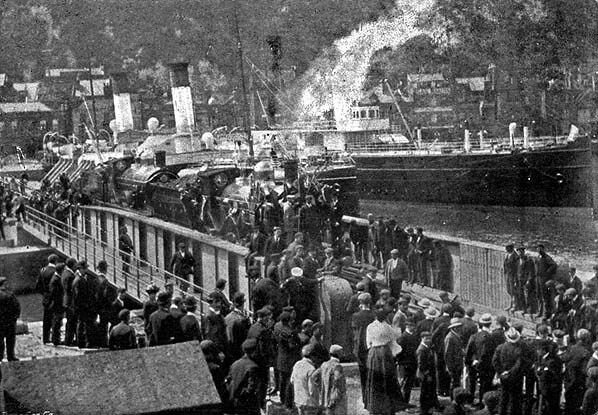 The first steamer berthed alongside the Prince of Wales pier in July that year, but initially services were irregular. The Mayor of Dover, Sir William Crundall, who was a member of Dover Harbour Board, saw its potential for cruise ships. The SE&CR, who also had representatives on the Harbour Board, agreed and obtained an Act to build a line from Harbour Station to the Pier. At the end of 1903 one of the Hamburg-American liners called at Dover on an experimental visit. This was followed by an agreement between the shipping company and the Harbour Board for the steamers to regularly call at Dover from July 1904. In order to provide access to the new line, part of the down platform of Harbour Station was rebuilt on wheels, so it could be swung out of the way when required. A single railway track was constructed; from the Harbour Station, it followed the north and east sides of the Granville Basin running alongside Union Street, across the channel linking the Tidal Basin with Wellington Dock and along the pier, connecting with the projecting shipping berths where it became double track. Its course to the pier required the demolition of the central section of the ‘Esplanade’ Hotel which stood on the route and the moving of the Granville clock tower. The original 1846 swing bridge was replaced to carry the railway over the Wellington Dock tidal lock to reach the pier. A passenger platform was provided towards the end of the east side of the pier with a timber canopy projecting over both the platform and the landing stages, providing protection from the weather for passengers. There was a timber building at the end of the platform and another close to the lighthouse; these included a waiting room and telegraph office. 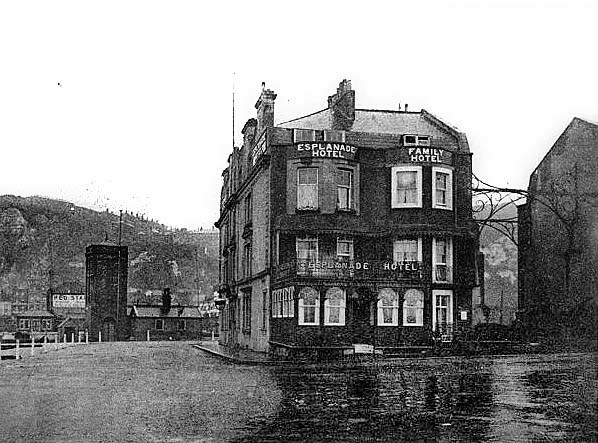 The Dover Express of 6 June 1904 reported that Mr Coxan of the ‘Lord Warden’ Hotel had been licenced to serve refreshments in the building. The first train ran onto the pier on 25 June 1904, and the pier was at last able to fulfil its potential. Despite problems with currents caused by the initial building of Prince of Wales Pier beyond the length of the incomplete Admiralty Pier, Dover flourished in 1904 with the arrival of the first ocean liners. The Prince of Wales berths were capable of accommodating some of the largest ships then afloat as they had a depth of 40ft even at low tide. For a brief period between 1905 and 1906 German liners of the Norddeutsche Lloyd and the Hamburg-Amerika line would call at Dover on their way to New York. From 1881 until 1914 the Hamburg-Amerika Line was the world's largest shipping line. It transported hundreds of thousands of emigrants from Germany, Scandinavia, and eastern Europe to the United States, Canada, Latin America, and other destinations around the world. Their first liner to call at Dover was the 'Prinz Waldemar' in July 1904. Unfortunately, as the outer harbour was nearing completion, and the gap between the Southern Breakwater and the Admiralty Pier was narrowing, the currents through the newly formed western entrance made handling these large vessels difficult, especially in bad weather. On one occasion, the Hamburg-Amerika line's 'Deutschland' crashed into the pier. The Hamburg-Amerika Line moved its operations to Southampton in 1906 with the other liner companies following suit over the next two years. When the Admiralty Harbour, consisting of the extension to the Admiralty Pier, the Southern Breakwater and the Eastern Arm, was completed and opened by King George V in 1909, the Prince of Wales became an inner pier to the harbour. With the outbreak of war in 1914 all passenger services ceased to operate and the pier taken over for military use including a 6in rail-mounted gun for use against German airships. After the war, the ferries and liners never returned to the Prince of Wales Pier with a regular service although some liners did berth there in the 1930s. In later years, the Harbour Board tugs, Lady Brassey and Lady Duncannon were berthed alongside on the western side of the pier. Dover Harbour was particularly important in the Dunkirk evacuation when 200,000 men were returned from Dunkirk to Dover in eight days. During this period the Prince of Wales Pier was one of many places used for disembarking returning troops. In May 1960 the 'The Lighthouse' opened at the pier head. A circular licenced bar surrounded the lighthouse giving customers a panoramic view of the harbour, and there was a café to the rear. This replaced an earlier café that had opened some time after WW1. In the mid 1970s work was started to replace the open ironwork section with a solid pier. The harbour to the west of this was reclaimed from the sea for the building of the new hoverport, which opened in 1978 at a cost of £14 million. The lighthouse was badly damaged during the ‘hurricane’ of 16 October 1987 when the Zeebrugge ferry Seafreight Highway rammed into the floor beams of the ‘Lighthouse' bar and café. The beams were attached to the lighthouse and the impact wrenched it sideways, leaving its upper section about a foot out of line from its base. The café and other buildings around the base were demolished and the lighthouse was dismantled. All the 400 granite blocks in the 22 uppermost courses were salvaged, cleaned, and numbered so they could be used in the rebuilding scheme. The lighthouse is tapered, so each block had to be put back into the course from which it was taken. The lantern's copper dome and cast iron base were refurbished and painted at the pierhead, and then craned back into position. A new glass lens was needed for the lantern but the Harbour Board had an original spare in its stores. New handrails were fitted around the lantern. The repaired stonework was given two coats of white paint, and soon the lighthouse was back in service, looking as good as new. A new single-storey cafe was built but this time it was detached from the lighthouse. In 1993 a ‘Seacat’ catamaran berth was built alongside the pier as part of the Hoverport complex. In 1994 the Channel Tunnel opened and, even though the Hovercraft was still the fastest way to cross from Kent to France, its days were numbered. In 2000 Hoverspeed decided to end hovercraft operation. The abolition of duty-free sales in June 1999 had resulted in a significant drop in passenger numbers. On 1 October 2000 the last Hovercraft was brought up onto the beach outside the former ‘Churchill’ Hotel in Dover at the spot where the first hovercraft had landed in 1959. Seacats took over the service the following day. Rising fuel costs, the loss of duty free, a declining market and fierce competition finally put paid to Hoverspeed who announced after much speculation that they would cease operations entirely on 7 November 2005. The Hoverport buildings on the reclaimed land adjacent to the pier were demolished during the summer of 2009. The pier was Grade II listed on 1 December 1975 principally because it is the only Dover Harbour structure designed by Sir John Coode, probably the most distinguished harbour engineer of the nineteenth century, and completed by the firm of Coode, Son and Mathews. It survives substantially intact with its lighthouse and many of the original features. It also forms part of a group of other listed structures in Dover Harbour. The Dover Harbour Board does however have radical plans for the pier which will only levae the end of the pier in anything like its original state. Click here to see an artists impression of what the harbour and pier might look like after redevelopment of the Dover seafront. At present there is free public access to the Prince of Wales Pier. It is open from 08.00 - 19.00 September to May and 08.00 - 21.00 June to August. For further information on Dover's railways and the Admiralty Pier see Dover - Lock and key of the Kingdom web site and East Kent Local History Pages for pictures of railway remains at Admiralty Pier. 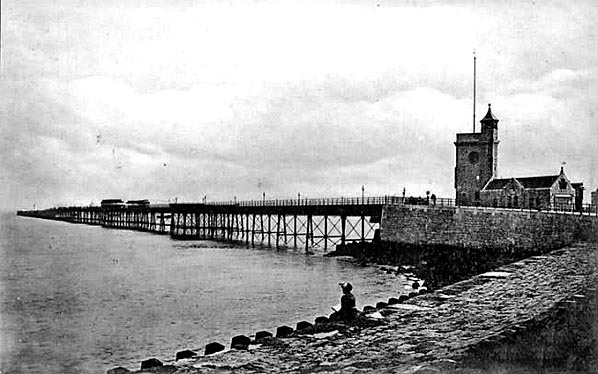 The Prince of Wales Pier in 1902, possibly before opening as there is no toll kiosk at the pier entrance. The ramp up to the pier alongside the Granville clock tower is built of stone. As the pier goes over water the pier is built on a framework of cast iron trestles on screw piles with lattice girders similar to many other Victorian seaside piers of the time including the nearby Promenade pier. It was planned that the recesses on either side of the first section of the pier would be covered to provide protection from the weather. It would appear from this view that only the middle pair were covered. East Pier at this time. From 'The Times' 10 October 1892. Click here for a larger version. 1898 1:2,500 OS map shows the pier under construction. Although named 'Prince of Wales Pier' in 1893 it is just identified here as 'Pier'. The 'Granville clock tower' has not yet been moved and is seen here in line with the entrance to the pier. The ‘Esplanade’ Hotel is also blocking the route of the future railway line. The three bays either side are covered areas to provide protection from the weather for members of the public using the pier. Click here for a larger version. 1907 1:2,500 OS map shows the completed pier, now named 'Prince of Wales Pier’. The 'Granville clock tower' has now been moved to allow a single-track railway line to be laid along the pier. The centre section of the ‘Esplanade’ Hotel has also been demolished to allow the line through. This line crosses Wellington swing bridge over the entrance lock to Wellington Dock before running onto the pier. Landing stages are seen on both sides at the end of the pier; also shown is the passenger platform alongside the eastern berths. There is a passing loop just before the landing stages are reached. At the bottom of the map, the north end of the Admiralty pier is shown with the former SER line curving round to the left past Dover Town station and the former LC&DR line passing to the east of the ‘Lord Warden’ Hotel and running into Dover Harbour station. Click here for a larger version. 1957 1:2,500 OS map showing the seaward end of Prince of Wales Pier. All evidence of the landing stages and the passenger platform has gone as has the single-storey building near the lighthouse. A café is shown, built against the lighthouse with public toilets alongside. The ‘Esplanade’ Hotel c1903. The central section of the hotel has been demolished but the railway line onto the pier has not yet been laid through the gap. The channel between the tidal basin and Wellington Dock is behind the hotel. Looking south-east along the Prince of Wales pier from the Esplanade Hotel c1904, shortly after the railway track was laid along the pier. The building on the right is Dover's first lifeboat station which was built in 1866 by the Royal National Lifeboat Institution, which had taken over the lifeboat service from the Dover Humane and Shipwreck Institution in 1855. The building was modified in the late 1870s to accommodate a bigger lifeboat. The clock tower was built in 1876-7 to the designs of George Devey. The work was commissioned by the Dover Harbour Board. The tower was moved a short distance as it stood on the approach road to the pier. Both buildings are now Grade II listed. The entrance to the pier is protected by ornate gates; a kiosk for collecting tolls is seen on the right. In the distance the tall tower on the Admiralty Pier is a temporary lighthouse built c1900 as the pier was being extended. 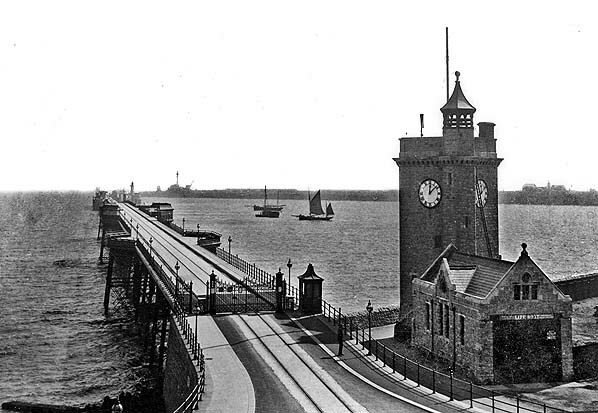 It was relocated (or replaced with a new lighthouse) at the new pierhead in 1908. The somewhat shorter lighthouse at the end of the Prince of Wales Pier is seen to its left. 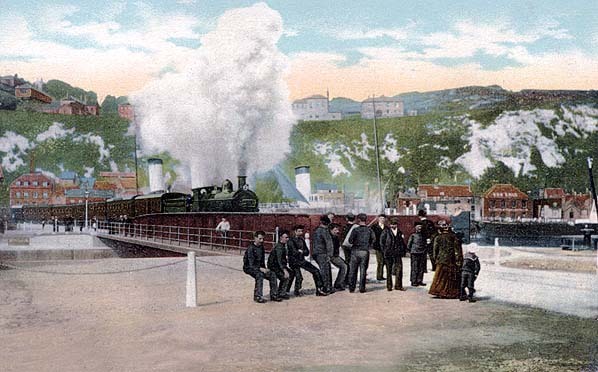 By the end of 1904 boat trains were a regular sight crossing the Wellington swing bridge and proceeding on to the ocean liner berth at the end of the Prince of Wales Pier. Looking out to sea from Dover beach on a hot summer day c1904. This view shows the exposed east side of the pier before the construction of the Southern Breakwater to complete the Admiralty Harbour. The 4212ft long breakwater was built between 1907 and 1909.